‘It’s only paper’ is something that I say to my students on a fairly regular basis; at least to the ones who are reluctant to commit pen to paper or paper to woodblock. However, here in Japan, paper is never really only paper. Paper here has significance from the architectural to the spiritual and perhaps the most important paper of all is washi. Without plunging too deep into the science, washi is more akin to fabric than paper. Consisting of a tangle of long bark fibres, usually mulberry (kozo), it is phenomenally strong and remains so when wet (forget about advertising claims for kitchen towels which, trust me, are as tin foil to sheet steel in comparison). It is this strength and good natured love of the damp that makes it the perfect paper for water based Japanese woodblock. As with all things, there’s a catch. Washi paper production is not easy. 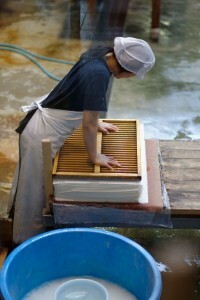 Hand made washi production even less so: it’s a brutal and demanding process. Bark has to be harvested, steamed, stripped, cleaned, picked over, beaten, mixed, formed and so forth. Mostly this seems to happen in the bitter cold, the only relief being the opportunity for a scalding when steaming the bark from the stems. It’s a huge tribute to the paper makers of Japan that there are still small concerns producing washi by hand among the more industrialised makers. One antidote to this hardship is the importing of bark fibres from China and Thailand where others get the chilly job of harvesting and processing. Except it’s not so chilly. Warmer climates means faster growth and softer fibres, changing the nature of the paper itself. Throughout this residency I have been printing on a wide variety of marvellous hand-made washi papers. They bring a luminosity to the print: the pigments entering the fibre itself and becoming one with the paper. I’m under no illusions: I won’t be able to get anything approaching this quality and weight of paper in the UK. Not yet anyway. But it doesn’t have to be like that. In 2014 there will be a Washi Fair at the International Mokuhanga Print Conference. I hope to encourage a UK paper stockist to visit with me to see beyond the small range of papers now available in the UK and to help in the ongoing work to support washi paper makers and to create a stable, affordable supply of these excellent printmaking papers for the future.